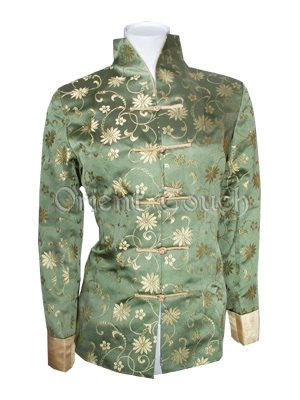 Elegant yet sassy, this wonderful jacket is made of quality silk brocade and designed with golden daisy patterns. Featuring a fashionable neckline cutting and Chinese traditional frog closures, it also comes with folded sleeves in matching gold satin fabric. Wear it for special occasion or just for everyday casual wear, the choice is up to you!